Linus Pauling at his Deer Flat Ranch home, near Big Sur, California. 1987. In January our first major video release was launched. 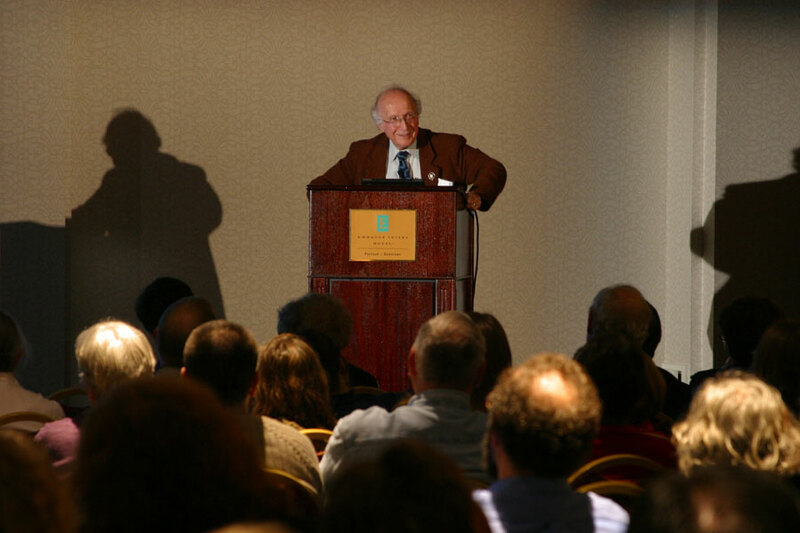 The conference proceedings from the two-day event “The Scientist as Educator and Public Citizen: Linus Pauling and his Era,” was the first of five Special Events video projects made available in 2008. 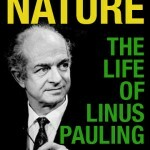 The three other Pauling-related Events projects completed in 2008 were “The Life and Work of Linus Pauling (1901-1994): A Discourse on the Art of Biography,” posted in May; “Ion Channel Chemistry: The Electrical System of Life,” posted in June; and “Prospects for World Order,” Noam Chomsky‘s contribution to the Pauling Peace Lectureship, posted in July. All told, over twenty hours of fully-transcribed video were released by the OSU Libraries Special Collections this year. 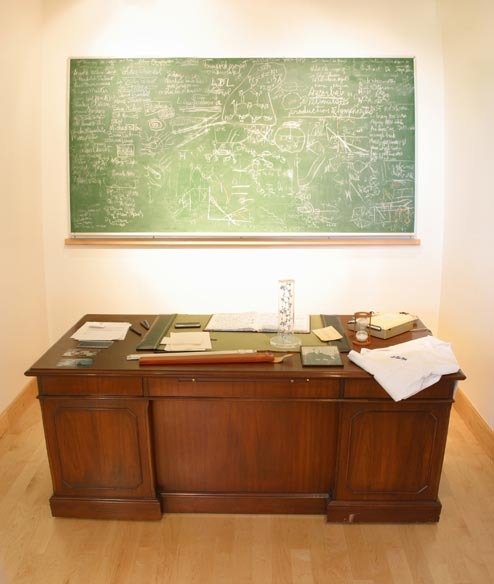 In February a revised and vastly-expanded version of the website “Linus Pauling and the Nature of the Chemical Bond: A Documentary History” was unveiled. Originally launched in December 2004, the “enhanced” version of the chemical bond website included over 1,400 pages of new manuscripts, papers and letters, 1.75 hours of additional audio excerpts and 2.5 hours of previously-unpublished video clips. A different documentary history website, “It’s in the Blood! A Documentary History of Linus Pauling, Hemoglobin and Sickle Cell Anemia,” received similar treatment in October. On March 4th, The Pauling Blog was unfurled. Since then, we’ve generated 92 posts, gone through two site themes and tinkered quite a bit with our WordPress widgets (we’re using 12 of them currently). On March 6th, Linus Pauling was honored by the United States Postal Service with his own stamp. Around 8,000 sets were sold at the Corvallis first day release party, which was held in tandem with an event in New York City. On May 5th, Nobel chemistry laureate Dr. Roderick MacKinnon received the fifth Linus Pauling Legacy Award, presented every other year for achievement in an area of study that Linus Pauling once researched. On December 15, Pauling was inducted into the California Hall of Fame. By our count, this is at least the eighth award that he has received posthumously. Second in popularity is, per usual, the mammoth Linus Pauling Day-by-Day project (3.71 million), which currently provides a daily accounting of Linus and Ava Helen Pauling’s activities for the years 1930-1954. Our four Documentary History websites jockey back and forth for third through sixth places. Having received a big update in February, the Bond site is a clear favorite right now, though Blood will probably move up as well, having also been recently revised. Here’s a look at how the numbers are shaking out for the major projects under the specialcollections/coll/pauling domain. 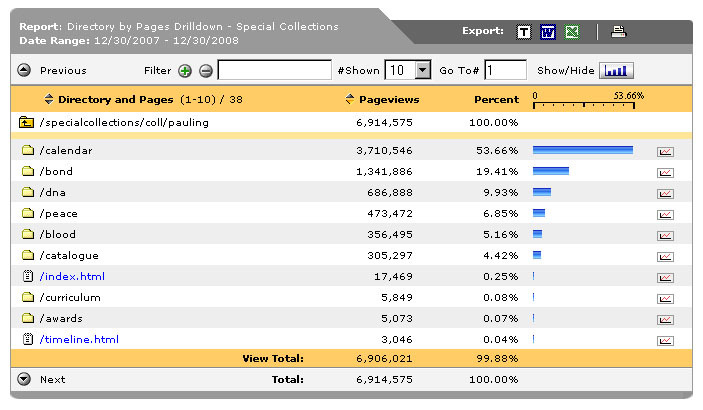 Check back on Friday for a few thoughts on search and a peek at 2009. As the Phillies and Rays prepare for another rendition of the Fall Classic, we thought it appropriate to share with you one of our favorite pieces of video: Linus Pauling playing beach baseball at a Caltech chemistry department picnic in 1938. Author of more than 1,100 published articles and inarguably one of history’s great minds, Pauling’s knowledge of the strike zone was, evidently, a little less authoritative. And while coaches around the world would surely appreciate Pauling’s hustle on the basepaths, one does fear for the safety of those enlisted to play third for any team opposing the two-time Nobel prizewinner. The Linus Pauling baseball clip is just a small segment of “The Edward W. Hughes Tapes,” a series of home movies recorded by Hughes, for twenty-five years a colleague of Pauling’s at Caltech. The Hughes tapes, which run to just under an hour, offer fascinating glimpses of Caltech social gatherings and Pasadena life over the course of five decades. Along with Linus and Ava Helen Pauling, careful viewers will note the presence of multiple scientific luminaries in the films — Albert Szent-Györgyi, Dorothy Hodgkin, Jerry Donohue, James Watson and Francis Crick, to name a few. [Pauling’s] illness from nephritis and his frequent trips meant that we did not see him very often, but he and his family did occasionally attend the Caltech Chemists games of (intermediate) baseball in the local league. Seventy-five feet between bases, softball, but hardball rules and overhand pitching from 57.5 feet. I made the local newspaper for an unassisted triple play while playing center field. Oregon State University, of course, has become something of a baseball powerhouse, given the Beavers’ back-to-back national championships in 2006 and 2007. Our colleagues in the University Archives have created a terrific website documenting the evolution of this program through its centenary: Oregon State Baseball: 100 Years to a National Championship, 1907-2006. 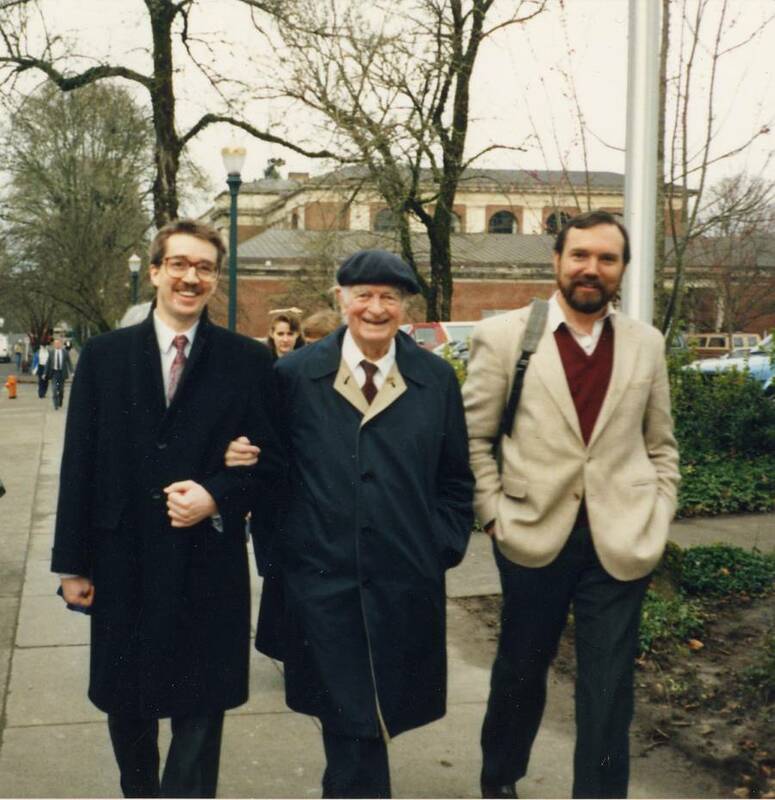 Cliff Mead, Head of the OSU Libraries Special Collections, Dr. Linus Pauling and Pauling biographer Tom Hager. OSU campus, 1991. 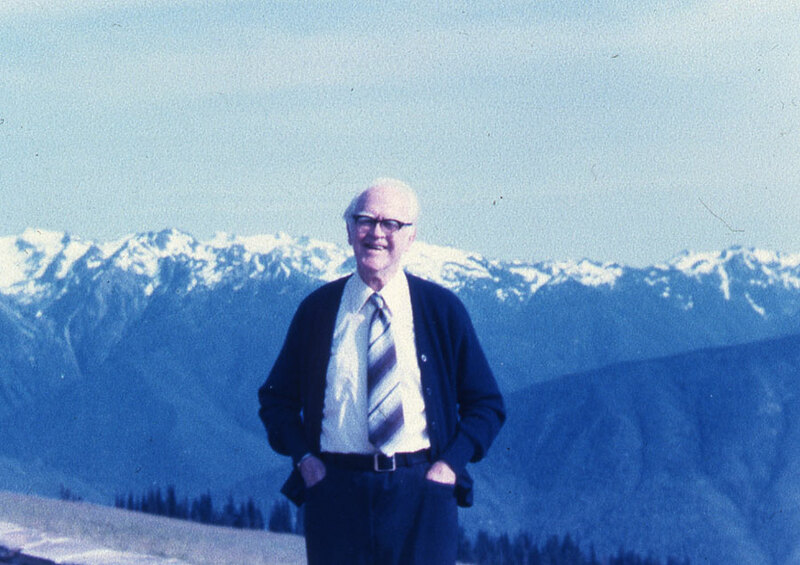 Chester Bateman, a researcher in the Oregon State University College of Education, has made available an interesting new Pauling-related podcast as part of the College’s Grassroots Learning Project. The 33-minute podcast, which features Pauling biographer Tom Hager as well as two students from Corvallis, Oregon’s Linus Pauling Middle School, was recorded in tandem with Hager’s keynote presentation on the opening night of da Vinci Days, Corvallis’s annual celebration of art, science and technology that marked its twentieth anniversary this past July. In the podcast Hager provides fascinating insight into both Pauling’s life as well as the details — and numerous surprises — that defined Hager’s long process of interpreting the sprawling Pauling biography for the printed page. The many other topics that Hager discusses include the major role that Ava Helen Pauling played as role model, confidant and working colleague to her world famous husband. 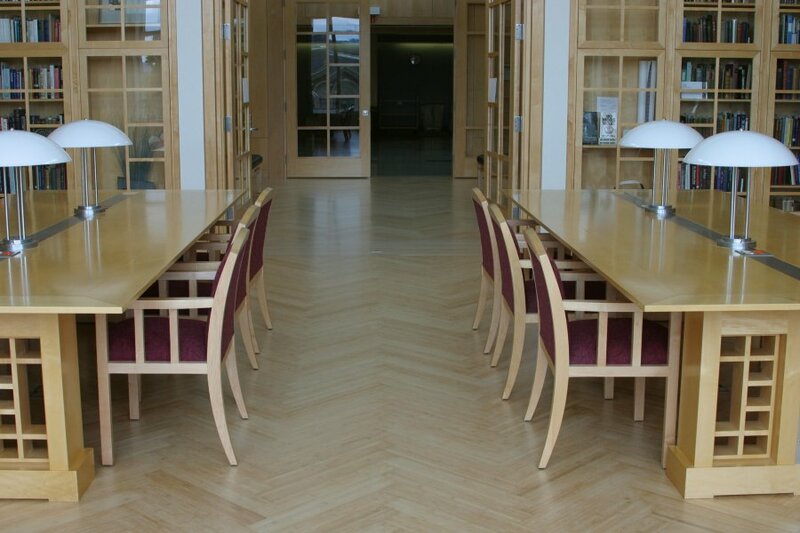 As Bateman notes, a plaque has been placed in Education Hall, marking the location where Linus Pauling and Ava Helen Miller first met. As part of his da Vinci Days coverage, Bateman also provides a link to a 3-minute youtube video produced by the Linus Pauling Institute which features LPI administrative officer Steve Lawson discussing the contours of Pauling’s scientific research and peace activism. Increasingly, the archival profession is being compelled to cope with a large influx of content that is “born digital” — email and digital photographs, for example — rather than recorded on a “hard” medium like paper or videotape. While this societal shift away from “hard copies” does pose major challenges for archives and special collections, it likewise has created significant new opportunities to provide remote access to many different types of content. In a manner similar to the work that Bateman is carrying out, OSU Libraries Special Collections has recently focused on expanding its multimedia offerings. In 2008 alone, over twenty-two hours of fully-transcribed video — including two talks by Tom Hager — have been released on the department’s Special Events website, with plans for much more in the works. 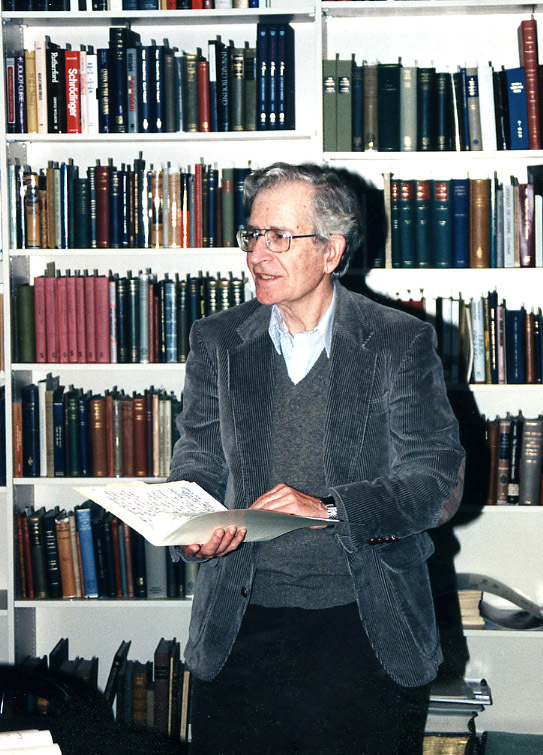 Noam Chomsky in the original Special Collections reading room, Kerr Library, 1995. The latest addition to the rapidly-expanding volume of transcribed video on the Special Collections website is a two-hour presentation by Massachusetts Institute of Technology professor Dr. Noam Chomsky. Titled “Prospects for World Order,” Chomsky’s talk was delivered on the Oregon State University campus on the fiftieth anniversary of the founding of the United Nations, October 24, 1995. As is typical of the prolific and highly-controversial social critic, Chomsky’s presentation is a sprawling discourse filled with historical data points that jump all over the map (both figuratively and literally) in support of his central thesis – namely (in simplest terms) that the wealthy and powerful have become so largely by way of the often-ruthless exploitation of most of the world’s inhabitants. While many may object to various aspects of what Chomsky has to say, the talk undeniably provides a great deal of food for thought. So what is the connection to Linus Pauling? Well, for starters, Chomsky was speaking as the fourteenth Ava Helen and Linus Pauling Lecturer for World Peace. Initiated in 1982 as a joint effort by Linus Pauling and the OSU College of Liberal Arts, the annual lecture was founded in memory of Ava Helen Pauling, whose peace work is well-documented on this blog and elsewhere. 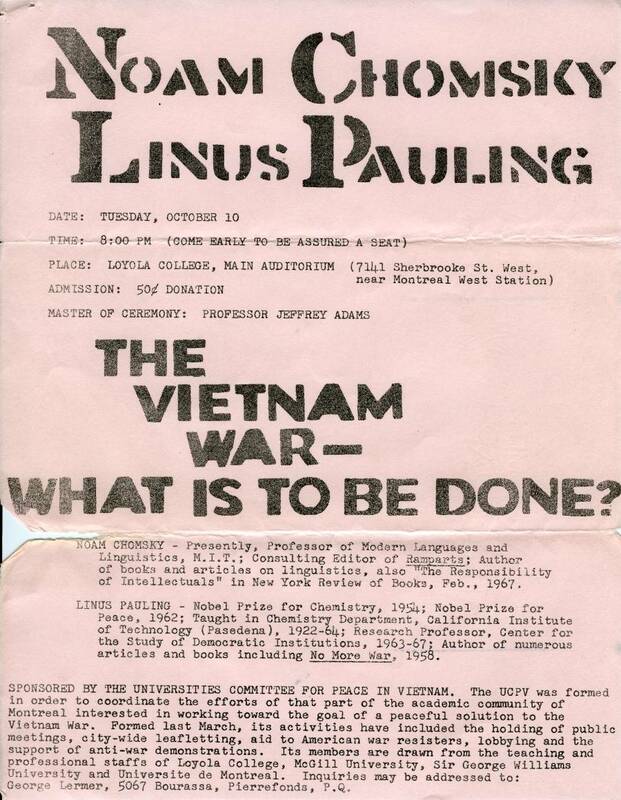 In 1995, the year of Chomsky’s presentation, the lecture was renamed to include Linus Pauling, who had died a little over one year before the event. Flyer for a joint Chomsky-Pauling presentation, Montreal, 1967. Pauling and Chomsky also knew one another, if not particularly well. The Pauling Papers contain one letter from Chomsky and, as can be seen here, the two presented together at least once during the Vietnam War era. Over twenty hours of fully-transcribed events videos – featuring, among others, Nobel Prize-winners Francis Crick, William Lipscomb, Dudley Herschbach and Roderick MacKinnon – have been released on the OSU Libraries Special Collections website since the beginning of 2008. Click here to access all of this intriguing content.